The CDCE937 and CDCEL937 devices are modular PLL-based low cost, high-performance, programmable clock synthesizers, multipliers and dividers. They generate up to 7 output clocks from a single input frequency. Each output can be programmed in-system for any clock frequency up to 230 MHz, using up to three independent configurable PLLs. The CDCE925 and CDCEL925 are modular PLL-based low-cost, high-performance, programmable clock synthesizers, multipliers, and dividers. 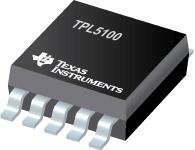 They generate up to five output clocks from a single input frequency. Each output can be programmed in-system for any clock frequency up to 230 MHz, using up to two independent configurable PLLs. The CDCE62002 device is a high-performance clock generator featuring low output jitter, a high degree of configurability through a SPI interface, and programmable start-up modes determined by on-chip EEPROM. Specifically tailored for clocking data converters and high-speed digital signals, the CDCE62002 achieves jitter performance under 0.5 ps RMS(1). "TPL5111 毫微定时器是一款低功耗系统定时器，非常适合占空比或电池供电类应用中的电源门控。 TPL5111 的流耗仅为 35nA，可用于启用或禁用微控制器或其他系统器件的电源，从而大幅降低休眠期间的总系统待机电流。 这样一来，便可以使用低容量电池，而且这一节能特性也使得 TPL5111 成为能量采集或无线传感器应用的理想选择。 TPL5111 提供可选定时间隔，取值范围为 100ms 至 7200s。 此外，TPL5111 还具有独特的单次触发功能，可使定时器仅在一个周期内将其使能脉冲置为有效。 TPL5111 采用 6 引脚小外形尺寸晶体管 (SOT23) 封装。"